On the 30th (Sat), take in the spiritual surroundings of Rock Church, get a dose of the wild on a nature and wildlife tour, then learn about all things military at Sea Fortress Suomenlinna, and finally take in the architecture and atmosphere at Helsinki Cathedral. Get ready for a full day of sightseeing on the 31st (Sun): look for all kinds of wild species at Sipoonkorven Kansallispuisto. For maps, reviews, and tourist information, read Helsinki road trip site . If you are flying in from Poland, the closest major airport is Helsinki Vantaa Airport. In March, daily temperatures in Helsinki can reach 3°C, while at night they dip to -5°C. Finish up your sightseeing early on the 31st (Sun) so you can go by car to Espoo. Espoo is the second largest city and municipality in Finland. 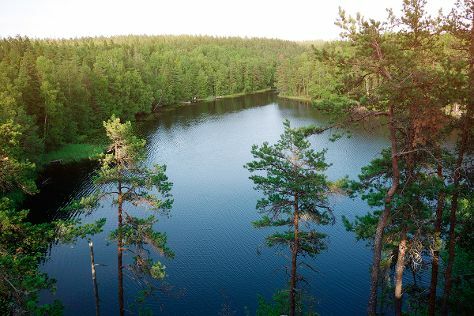 Start off your visit on the 1st (Mon): stroll through Nuuksio National Park. Get ready for a full day of sightseeing on the 2nd (Tue): make a splash at Serena Water Park. For photos, maps, traveler tips, and more tourist information, use the Espoo trip maker site . Espoo is just a stone's throw from Helsinki. In March, daytime highs in Espoo are 3°C, while nighttime lows are -5°C. Wrap up your sightseeing by early afternoon on the 3rd (Wed) to allow enough time to drive back home.